TFI Envision wins Gold & Silver in the 39th Annual Telly Awards | TFI Envision, Inc.
New York, NY — The Telly Awards is the premier award honoring the best in TV and Cable, Digital and Streaming, and Non-Broadcast Productions. Their mission has been to strengthen the visual arts community by inspiring, promoting, and supporting creativity. On average, the Telly Awards receives over 12,000 entries yearly from all 50 states and 5 continents. The judges consist of a group of highly qualified advertising, production and other creative professionals. They are from all regions of the United States, representing large and small firms including advertising agencies, TV stations, production houses and corporate video departments. TFI Envision was honored to receive a Gold Award for Building One Community™ Logo Transformation Animation Video. This elegant, short video animates the transformation of a nonprofit from their original name and logo, Neighbors Link Stamford, to the new name, tagline and logo developed, Building One Community™ – The Center for Immigrant Opportunities. This transformation allowed the organization to be recognized for what they do, immediately. TFI Envision also received a Silver Award for BBB Industries, LLC “OE Overhaul” :30 second TV Spot Series . 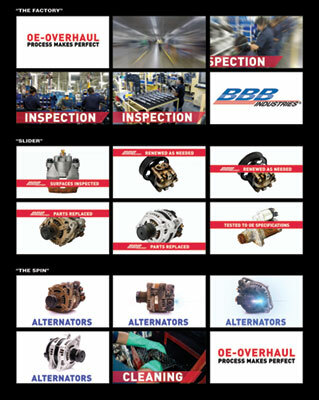 BBB Industries – a leading remanufacturer of automotive aftermarket parts – selected TFI Envision to develop this unique campaign to address misconceptions within the industry regarding remanufactured parts. OE is an automotive industry term for Original Equipment manufacturer parts. The Telly Awards was founded in 1979 to honor excellence in local, regional and cable TV commercials. Non-broadcast video and TV program categories were soon added. With the recent evolution and rise of digital video (web series, VR, 360 and beyond), the Telly Awards today also reflects and celebrates this exciting new era of the moving image on and offline.